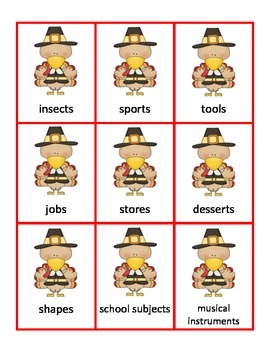 Turkey Lurkey Categories - Students give a category for given items or items for a given category. This can be played as a card game or a concentration game. T-U-R-K-E-Y - This is an open-ended game to use with your own skill cards. Students have a matching card and receive a letter each time they give a correct answer. The first to spell "Turkey" is the winner. 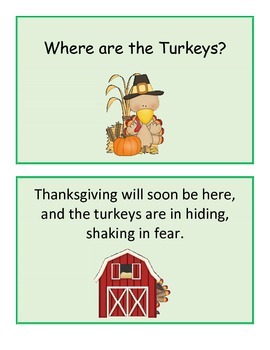 Where Are The Turkeys - Booklet for your little ones. Students help the farmer find the hiding turkeys while practicing the prepositions behind, beside, in front of, and on. 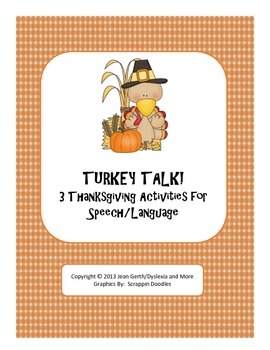 On the last page, pictures of the turkey are included for you to hide around your room. When students find the turkey they have to describe where it was placed. 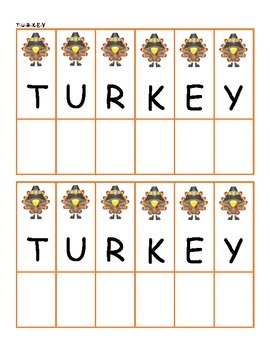 Also - check out "Turkey Puzzlers" in my Tpt store!